Fernhill stair parts are ideally suited for larger, grander staircases. These stair and handrail parts are ideally suited to larger hallways. This handrail spindle is produced in a choice of Pine, US White Oak, Sapele, Hemlock, Southern Yellow Pine and US White Ash. Grecian Fluted Spindles for landing balustrade and handrails are 1100mm to meet regulations. Spindles for landing balustrade made from a choice of timbers. 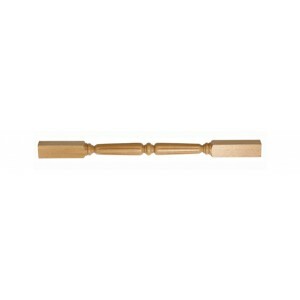 Landing spindles are longer than rake spindles that are used for stair balustrade. The Fernhill range of spindles are scaled to be used in larger hallways with a staircase that will work as a powerful structural feature that will work as a focal point for you entire home. 55mm square spindles are meant to compliment a grand balustrade that has a classic style.